If nothing else, it was an ambitious experiment. 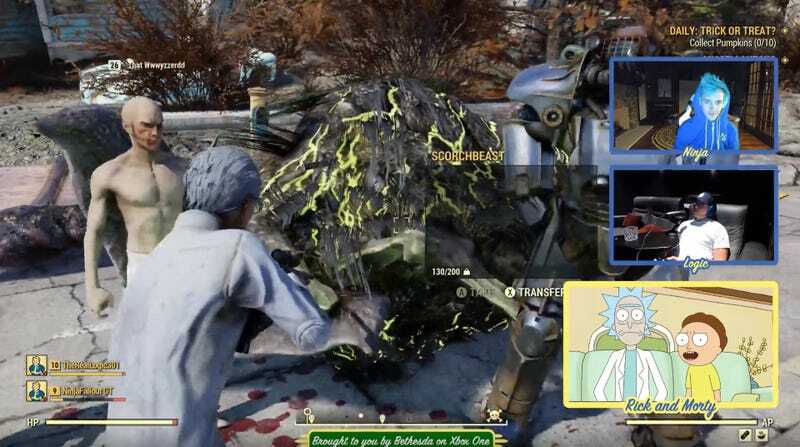 Last night on Bethesda’s Twitch channel, Ninja and Logic streamed normally from their respective locations, while Rick and Morty co-creator Justin Roiland voiced both Rick and Morty while playing. The animated pair appeared in their own on-screen window, depicted sitting on a couch and holding a game controller. The three (or four, depending on how you count these things) proceeded to romp around Fallout 76’s wasteland, attempting to crack jokes and enduring silences so awkward that they felt like tiny apocalypses of their own. Initially, it was easy to chalk the lack of chemistry up to technical issues. Straight out the gate, audio and gameplay failed to sync up, with Rick and Morty going on at length about car shooting and mole-rat-exploding shenanigans upwards of ten seconds before they actually happened. Then Logic revealed that he didn’t really know how to play the game, so that slowed the early goings down, too. As the stream went on, though, the squad just couldn’t seem to meet each other in the middle of their particular sensibilities. Everyone seemed nervous and out of their elements—even Roiland, who valiantly attempted to fill dead air with banter between his mismatched duo, but who was frequently met with non-responses that left little room for further improv. At one point, Rick tried to convince Ninja and Logic to strip off their armor and run around “naked” punching everything. In response, they just kind of brushed him off. It was such a weird moment! Ninja proceeded to talk about somebody who was following them, and Logic talked about his chair. But it was also kind of a perfect encapsulation of what each person was about and why the stream felt so strained. Say what you will about Ninja’s stance on streaming with women and linguistic gaffes, but he’s damn good at video games. So of course, that’s his focus here, too. Then you’ve got Roiland trying to perform his hyper-specific brand of improv humor, because that’s his whole thing. And lastly, you’ve got Logic wondering why he’s there. “Does Logic even talk?” a viewer asked in chat at one point. That’s not to say there weren’t a few decent moments. For instance, at one point Morty told Ninja an extended story about Rick burping under his bed that was just bizarre enough to work. There was also a bit about representation among Super Mutants that landed pretty well and got Ninja and Logic laughing. But when Roiland whiffed, he really whiffed. For instance, I’ve watched the following clip of Rick and Morty bantering about traps six separate times and still can’t figure out what Roiland was going for. Things proceeded more or less in this fashion for nearly three hours, and all the while, technical issues continued to take a toll. Most of the good stuff came toward the end, but by that point, viewers had already pretty much made up their minds about the whole thing. Ever since the breakout Drake stream that already feels like it happened a million years ago (note: it was in March), “Ninja plays a game with famous people” has become a stream genre unto itself. I’m sure, then, that Bethesda looked at Ninja, a famous rapper, and Rick and Morty, and saw demographic dollar signs. But having a bunch of good ingredients scattered across a table doesn’t mean you have a good cake. You’ve gotta make sure those ingredients work in concert first, and if you don’t, well, then all you’ve got is a mess.